In January 2004, Dubai announced Burj Khalifa to the world with the claim, ‘History Rising’. Six years on and history has most certainly ‘risen’. Burj Khalifa will soon be transformed into a vibrant community for thousands of residents, employees, hotel guests and tourists. Up to 12,000 people will live, work and play inside the world’s tallest building. The tower is the focal point of the 500-acre master planned community Downtown Burj Khalifa, which is widely described as the most prestigious square kilometre on earth. Burj Khalifa is the development’s crowing glory in every sense, a building that has pushed the boundaries of design and engineering further than many thought possible. Excavation work for the tower began soon after the announcement of its launch, with more than 60 contractors and consultants joining forces on a project of unprecedented scale and ambition. When construction work was at its most intense, more than 12,000 people from over 100 countries were working every day at the Burj Khalifa site. In total, Burj Khalifa took 22 million man hours to build. Mr. Mohamed Alabbar, Chairman, Emaar Properties, said Burj Khalifa was a shining example of global collaboration. “Burj Khalifa shows just what can be achieved when people from all over the world come together to strive for a common purpose.” Standing at more than 800 metres (2,625 ft), Burj Khalifa captivates audiences with its height. But its construction underground is equally worthy of fascination. More than 45,000 cubic metres (1.59 million cubic ft) of concrete, weighing more than 110,000 tonnes, make up the tower’s steel-reinforced foundations with 192 piles running to a depth of over 50 metres (164 ft). Work on Burj Khalifa’s superstructure began in March 2005, with the foundation work alone taking 12 months. 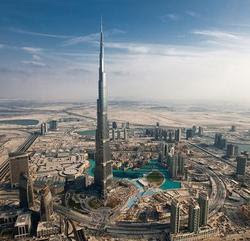 The distinctive triple-buttressed outline of the Burj Khalifa was inspired by the desert lily Hymenocallis. Extensive seismic and wind tunnel testing was carried out to perfect the design of the tower. The triple-buttressed shape of Burj Khalifa allows it to manage the effect of wind vortices generated around the tower, as well as changes in atmospheric pressure between its base and spire. The main construction material of Burj Khalifa is reinforced concrete, specially designed to withstand the staggering pressures inherent in the world’s tallest building. In total, Burj Khalifa employs a record-breaking 330,000 cubic meters (11.6 million cubic feet) of concrete; 39,000 metric tonnes of reinforced steel; 103,000 sq m (1.1 million sq ft) of double glazed glass; and 15,500 sq m (166,800 sq ft) of embossed stainless steel. Once the lengthy construction work of its foundation was complete, the vertical ascent of Burj Khalifa was surprisingly fast. The first 100 levels of the tower were completed only 1,093 days after excavation started. A level was added every three days before the uppermost levels of the tower were reached. In November 2007, the concrete for the highest reinforced core walls of Burj Khalifa was pumped from ground level to a height of 601 metres (1,978 ft), breaking the previous record for concrete pumping held by Taipei 101. The pressure generated during the pumping work reached nearly 200 bars. Work on the glass and aluminium exterior cladding of Burj Khalifa started in May 2007 and was completed in September 2009. Nearly 400 skilled engineers were assigned to the project. At the outset, around 20-30 cladding panels were installed each day. The daily rate of installation reached 175 panels as the project neared completion. Burj Khalifa has set a new world record for the highest installation of an aluminium and glass façade, at 512 metres (1,679.8 ft). A staggering total of 24,348 panels cover a curtain wall area of 132,190 square metres (1.4 million sq ft). But the Burj Khalifa’s shimmering exterior is designed to minimise heat transmission into the building itself, therefore saving energy. Condensation from the panels is also collected and used for landscape irrigation. Burj Khalifa’s spire may resemble a needle at ground level, but in reality it is a colossal structure made up of 4,000 tonnes of structural steel. Nor is it exclusively ornamental, housing as it does communications equipment for the tower. With a total built up area of around 6 million square feet, Burj Khalifa is set to become a living, vibrant community in the heart of Dubai. Around 2 million square feet inside the tower is dedicated to luxury residential apartments, while more than 300,000 square feet is allocated for office space. That’s in addition to the sections of the tower taken up by the world-first Armani Hotel Dubai and the Armani Residences Dubai. Countless artworks by prominent Middle Eastern and international artists, including sculptures and various contemporary installations, adorn the interiors of Burj Khalifa and line Emaar Boulevard throughout Downtown Burj Khalifa. A total of 57 elevators and eight escalators serve people living, working and enjoying their leisure time inside the tower. Burj Khalifa has four swimming pools, a cigar lounge, residents’ lounge, the fine dining restaurant ‘At.mosphere’, and a variety of health and fitness facilities. Moreover, the tower’s 124th floor observation deck, ‘At the Top, Burj Khalifa’, offers 360-degree views of the city and is open to the public. Burj Khalifa features ‘The Offices’, a 12-storey annex of prime office space; ‘The Club’, a four-storey health and fitness centre; and ‘Armani/Pavilion’, an outdoor entertainment venue that opens onto the Burj Khalifa Lake and The Dubai Fountain, described as the world’s tallest ‘performing fountain’. Visitors to the ‘At The Top, Burj Khalifa’ observation deck can read the ‘I am Burj Khalifa’ legend once they reach the ‘From the earth to the sky’, section of the tour. Its opening stanza reads: “I am the power that lifts the world’s head proudly skywards, surpassing limits and expectations. Rising gracefully from the desert and honouring the city with a new glory, I am an extraordinary union of engineering and art, with every detail carefully considered and beautifully crafted...” “I am the heart of the city and its people, the marker that defines Emaar’s ambition and Dubai’s shining dream. More than just a moment in time, I define moments for future generations…” From the ‘‘From the earth to the sky’’, one can view Level 124 and the summit of Burj Khalifa at a near vertical angle. Rare coin valued at 2.3 million pounds..